As an Administrator, you can now limit the Staff Members' (i.e., teachers, club coaches, team managers, supervisors, etc.) ability to send SMS messages to a group. This can be done through the Organisation's Settings or through the eForm itself. 2. Scroll down until you see the section for Staff Privileges. There is a checkbox for Allow carers to send SMS messages. Tick this box if you want to enable this functionality and click Save to apply changes. 1. Click the three horizontal lines icon on the eForm. 2. 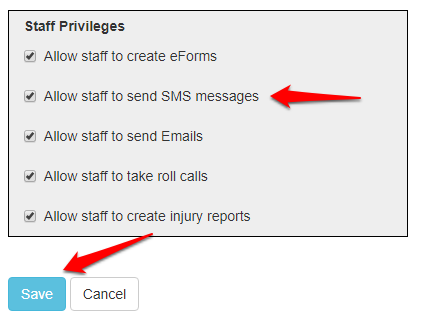 Go to the Settings tab, tick the box for Allow staff to SMS, and then hit Save and Preview. 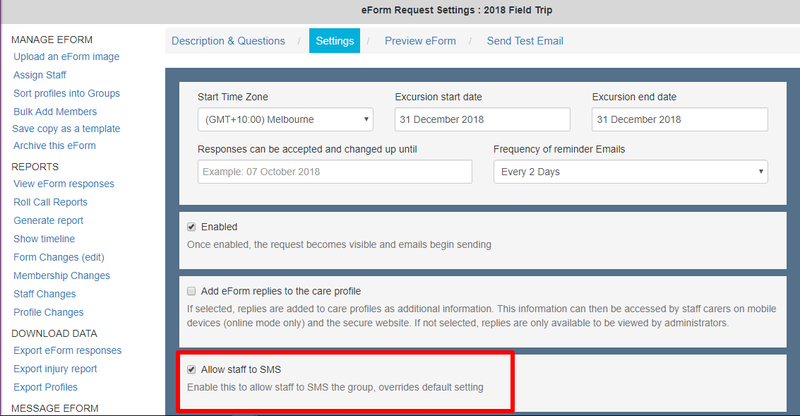 NOTE: If your global setting is set to not enable SMS, this will override the global setting and still allow Group Carer to send SMS messages.